I have been playing golf for over 20 years, and it is still not easy to absorb all thoughts and tips to improve game of golf. There are books and CDs and websites, but I have been thinking of what would be the most important and simple thoughts that can be applied to the game of golf once we are in the course. Here are three ways I’d like to share with everybody who want to improve and maintain stable and solid round of golf in the field. We all understand that there are strong and weak and neutral grips that can be used for each individual. 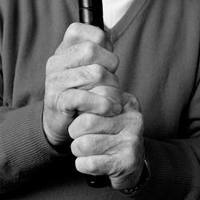 A strong grip tends to promote the draw, and a weak grip would promote fade or slice. A player can pick and choose a certain grip which will best fit to the ball striking of individual. One thing I realized that was not emphasized enough is level of pressure of grip. Are you gripping firmly or softly or do not care? Based on the several rounds of playing, I realized that it would be much better and stable if we grip fairly firm. Imagine you are holding the jack sledge hammer. You need to grasp the hammer very firmly to generate power and strength when hammering down the nail. I’d like to suggest that when you grip the golf club please apply reasonably firm pressure and grasp handle fairly firmly. Sometimes the ground of golf course would be dry and hard, and this situation could create the feeling of fear or lacking of confidence. It is very psychological. We can overcome this weak feeling when applying enough pressure to the grip. Try this for driver or iron shot or even putting. Please remember the fairly firm grip. One plane golf swing has been discussed in golf circle for some time, but I think the level of understanding has been varying. My focus is rather on the left hand and arm (assuming you are right handed) together with a golf club. Think of one plane golf swing as a huge CD (computer disk) surrounding your body around. The plane of CD is not bent or crooked, but straight and flat. Can you imagine that your swing with left hand simply glides along the surface of CD? 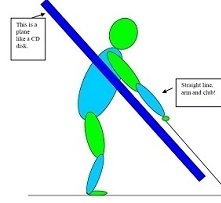 I mean your left hand connected to club is as straight as possible and cruise along the CD plane? The focus is on the left hand (assuming you are right handed) which is almost close to the straight line when extended with club. There would not bemultiple (two or more) complicated swing planes, and thus this will definitely help simplify the swing. Golf swing would be much more simple and controlled. A lot can be talked about finish, but I’d like to emphasize just a couple of points. When you do back swing, please take away club far and far out and make sure the left shoulder touches the chin, which indicates you did full back swing. Your eye should see the ball directly at this time. Now it is time to do down swing to hit the ball. When the club head strikes the ball, please remain your eye on the top of ball and on the divot for a little while. Do not turn your eye and head ahead of hitting. Let the second part of swing after hitting be complete naturally as continuation of a whole swing that has started and moved along the one plane. This will definitely promote the stable and solid ball striking and finish. Enjoy better golf this summer. Thanks.